CAT I Series breaker analyzers and timers are simple and easy to operate instruments, with a rugged design for field use, which provide accurate measurement in high voltage environments, measurement in time and in motion, voltage measurement and current and provide a detailed analysis of the test results using the DV-Win software. These instruments are independent or digital controlled by a computer for the evaluation of the conditions of switches. The timing channels are capable of recording the closing and opening of the arc, the resistance and the auxiliary contacts. The CAT I series presented by Amperis records the graphics of the trip and closing coil currents and the displacements of the moving parts of the high and medium voltage switch. The main contact channels can also measure the resistance value of the pre-insertion resistors (if present in the switch). Once the test is done, the results can be downloaded to a USB or stored in the internal memory, capable of storing up to 500 results between numerical data and graphics. The test results can also be printed in tabular and graphic form on the optional 80 mm thermal printer. If a predefined delay time is used or by detecting the switch contact position, several operations can be initiated, such as Trip-Close and Trip-Close-Trip. Several triggers for time measurements are available to record a measurement under various test conditions: external trigger, analog channels, auxiliary channels and coil control channel. Auxiliary inputs are used to monitor dry and wet auxiliary contacts. The external trigger input can be used as the additional auxiliary input. The two analogue coil control channels can measure and record coil currents simultaneously (Trip and Closed), up to 35 A AC / DC. The two additional analog channels have four selectable voltage ranges available: ± 0.5 V, ± 2.5 V, ± 60 V and ± 300 V AC / DC. The transducer channel is intended to measure the displacement of the moving switch parts, contact friction, overrun, rebound, damping time and average speed. 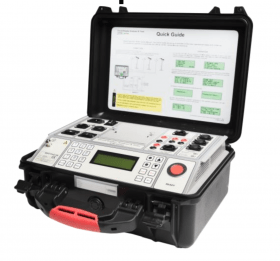 One of the most important tests of mechanical operations, to determine the actual condition of the switch, is the measurement of time (these tests meet the requirements defined by IEC 62271-100 and IEEE C37.09. In three-phase systems, all poles must operate at the same time as the contacts in a single pole must operate simultaneously. All contacts must be synchronized, within a certain tolerance limit. The synchronization between the poles of the circuit-breaker during opening must not exceed 1/6 of the nominal frequency cycle and during closing must not exceed 1/4 of the nominal frequency cycle. Simultaneous measurements within a single phase are important when a number of contacts is connected in series. The maximum difference between the instants of contacts that are touched within the interrupter units connected in series must not exceed 1/6 of the nominal frequency cycle. The maximum difference between the contact separation instants within the switching units connected in series must not exceed 1/8 of the nominal frequency cycle. The auxiliary contacts are mechanically driven by the operating mechanism and are used to control the state of the main contacts, but there are general requirements related to the time measurement of the auxiliary contacts described in the IEC® and IEEE® standards. In any case, in order to evaluate the state of the high voltage circuit breakers, it is important to verify their operation. The contact of type "a" follows the position of the main switch contact and must be closed / opened before closing / opening the main contact. The contact of type "a" is connected in series with the trip coil and interrupts the circuit of the trip coil when the switch is opened. Contact "b" must open / close when the operating mechanism has released its stored energy to close / open the switch. The "b" type contact is connected in series with the closing coil, interrupting the circuit of the closing coil when the switch is closed. The system movement measurement of the high-voltage switch contacts is of crucial importance for evaluating a condition of the test object. The three channels of the motion transducer take data from 3 linear or rotary motion transducers. 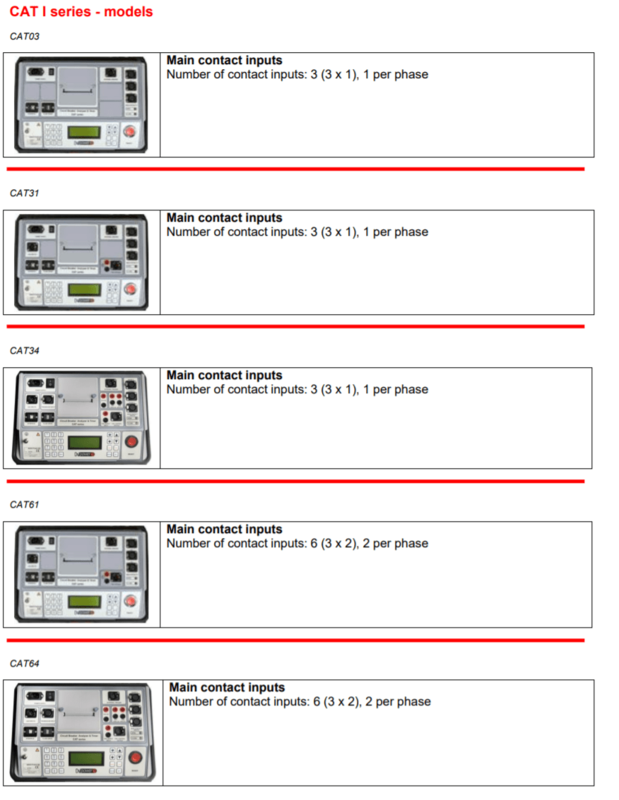 Each channel can be configured for a digital or analog transducer. The user has the possibility to connect a wide variety of motion transducers thanks to the universal design of the transducer channels. 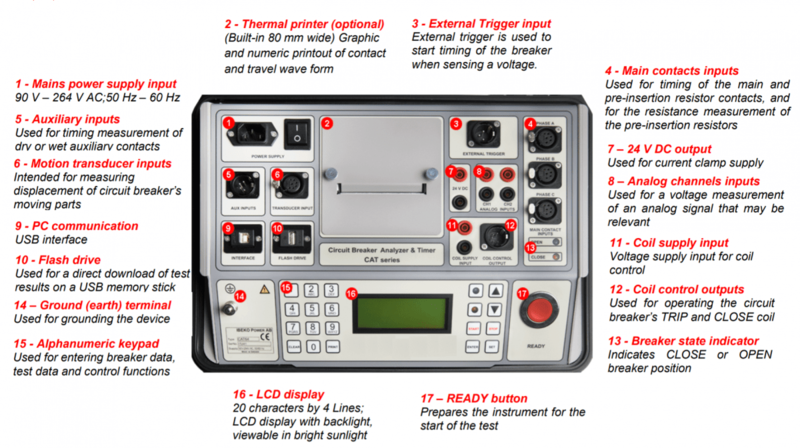 The performance values are obtained as a result of the measurement, being able to compare these values with the reference data of the manufacturer and the data acquired from the previous measurements, which indicates the wear of the switch. The average speed is calculated between the two points in the movement curve and the user can mount the transducers in accessible parts of the mechanical link of the switch. The instrument registers the rotary movement, but we know that the movement of the main contacts is linear, so the movement results represent the linear interpretation of the results, not the actual movement of the main contacts. The DV-Win software allows the user to define linear or non-linear parameters to obtain real displacement values of the moving parts of the main contact. The standard IEC 62271-100 establishes that the currents of wave form of coil must be registered, since it gives us information on the condition of the coils, on the release of the mechanism of operation and on the mechanism of operation. The sequence is as follows: The opening or closing command is started, the coil is energized and the intensity is increased. The plunger begins to move when the force on the plunger exceeds the holding force, this movement reduces the current. With the plunger at rest, the current increases to the saturation level. If the value of the current deviates from the specific, it can indicate a burned insulation or a part of the winding in short circuit of the coil. Meanwhile, the latch unlocks the operating mechanism, releasing the stored energy to open the main contacts of the switch. Normally, after a short delay, the auxiliary contacts open, disconnecting the control voltage opening coil. As the coil is deactivated, the current drops to zero. This analysis is fundamental to determine a condition of the operating mechanism of the coil. Since the switch spends most of its life conducting a current without any operation, when a protection relay detects a problem, it is essential that the switch, which was inactive for a prolonged period of time, operate as quickly as possible. As the friction of the firing mechanism may increase, it is important to perform this test from which we obtain information about the friction of the latch, the trip circuit contacts and the spring tension. 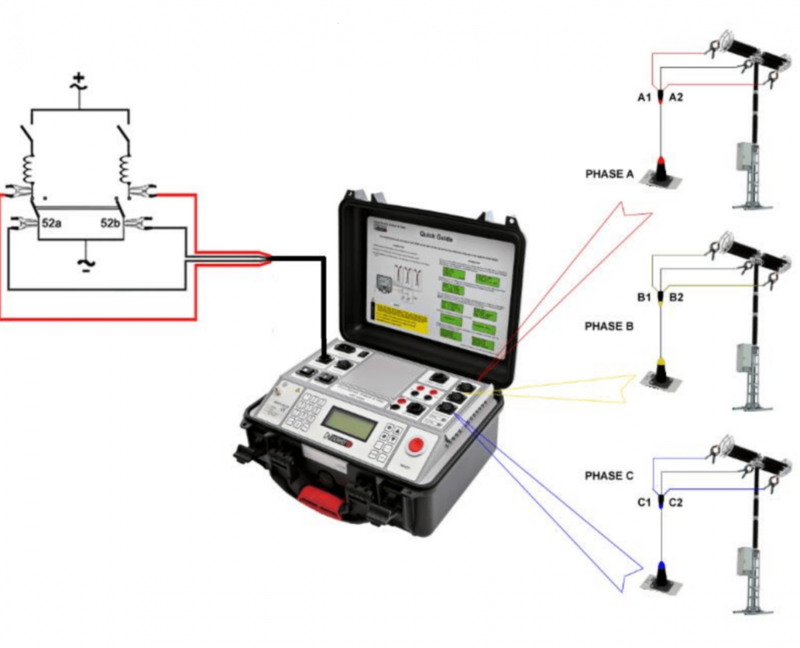 Since the switch is in service, the conventional way of measuring off-line timing can not be used so three current probes are used that show the current flow through the secondary side of the current transformer for each phase. The instant when the current stops flowing, the breaker trip time is revealed. 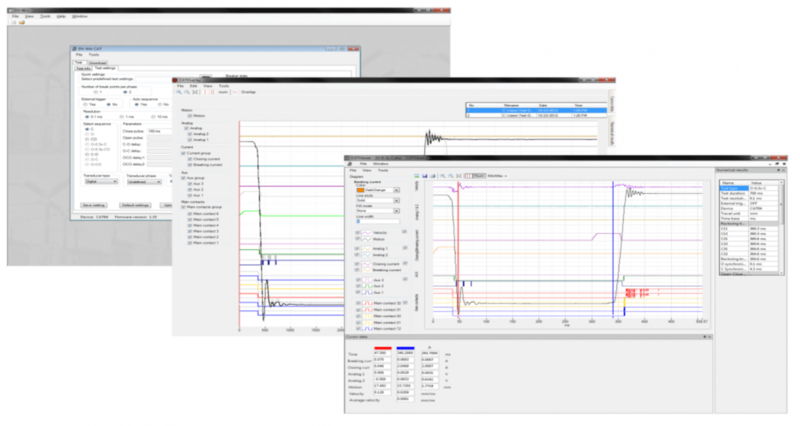 This software offers us the graphic presentation of a variety of measurements and timing test results. The DV-Win uses cursors and powerful zoom functions for detailed analysis with colors, scales and the positioning of the test are controlled by the user. The DV-Win exports the records in .dwc format and supports the automatic conversion of the units.